A flush mounted solution to tank ventilation for space limited installations. Conventional surface mounted vents can catch on dock lines and be a nuisance to fender whips; their covers can be broken off leaving vent screens exposed. Atwood offers a solution with this flush mounted vent. These vents are engineered to allow air to pass freely while keeping out water in normal conditions and during washdowns. 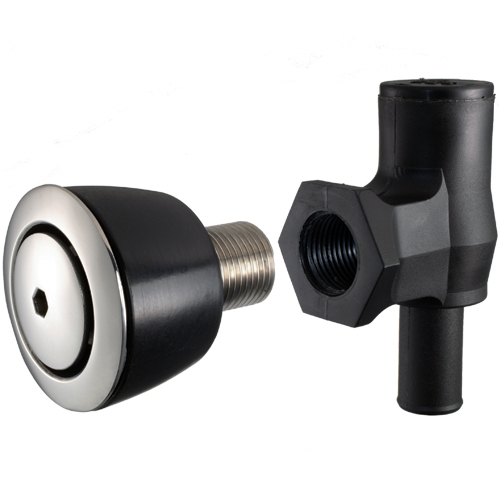 The 90° design is ideal for applications that are limited by space or benefit from hose runs that are perpendicular to mounting surface such in a coaming or step-thru. The polypropylene body is corrosion resistant and features a 5/8" barb for vent hose connection. The 316 stainless steel cover can be removed to clean the screen or to perform fuel system pressure tests. The vent’s flange and large locking wash provide suitable surface for bedding to seal out water. Atwood tank vents are great choice for a flush and modern look. Cut Out Dimension: 1 3/8"